Anaphylaxis (pronounced “an-a-fi-lax-is”) is a potentially severe or life-threatening allergic reaction that can occur very quickly—as fast as within a couple of minutes of exposure to the allergen. It can be triggered by an allergy to a particular food (peanuts or shellfish, for example) , biting or stinging insects (like bees) , medication (penicillin is a common one) , latex (the type of rubber many balloons are made from) or a variety of other allergic triggers. Read more about this topic here: What Causes Anaphylaxis? Anaphylaxis is the name of the potentially life‑threatening reaction that can happen when you’re allergic to bees, shellfish, peanuts or any other of a number of allergens. The symptoms of anaphylaxis can vary. Not everyone affected by anaphylaxis will experience the same thing, but common symptoms include hives , itching , flushing and swelling of the lips, tongue and roof of the mouth. The airway is often affected, resulting in tightness of the throat, chest tightness and difficulty breathing. These life-threatening allergic reactions can also be accompanied by chest pain, low blood pressure, dizziness and headaches. It's serious stuff, which is why your top priority should be avoiding your known allergen(s) as best you can. You may have heard of the term “anaphylactic shock,” which occurs when there is inadequate blood flow to critical organs of the body during a life-threatening allergic reaction. Though many people use this term interchangeably with “anaphylaxis,” that is incorrect. Shock can be just one of the many signs of a life-threatening allergic reaction. A person may not even experience shock during anaphylaxis. In fact, according to a 10-year study, more than half of all patients showed no signs of shock during anaphylaxis. Be careful to avoid allergens...and be prepared. That’s why it’s important to talk with your doctor about how to identify the signs and symptoms of anaphylaxis. 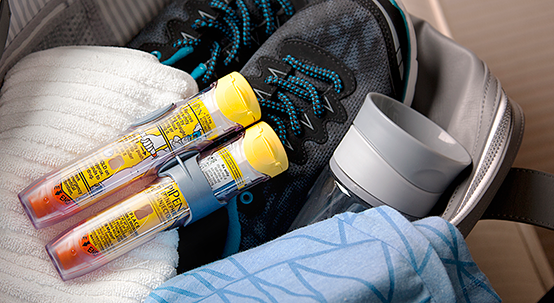 Ask your doctor if EpiPen® (epinephrine injection, USP) or EpiPen Jr® (epinephrine injection, USP) Auto-Injectors or their authorized generics are something you or your child should be prescribed, as part of an Anaphylaxis Action Plan. If you, your child or someone you're caring for shows signs or symptoms of a life-threatening allergic reaction, administer EpiPen® or EpiPen Jr® Auto-Injector, or Mylan’s authorized generics, immediately as prescribed and seek emergency medical care. Because they do not treat the life-threatening symptoms of anaphylaxis, antihistamines are not recommended as first-line treatment for anaphylaxis. It's important to administer epinephrine at the first signs of anaphylaxis. According to National Food Allergy Guidelines, epinephrine is the first-line treatment for life-threatening allergic reactions. A delay in administering epinephrine can be life-threatening.